Join a traditional owner of Uluru, a member of the Uluru family, on this seven-hour afternoon cultural tour to their homelands, Patji. 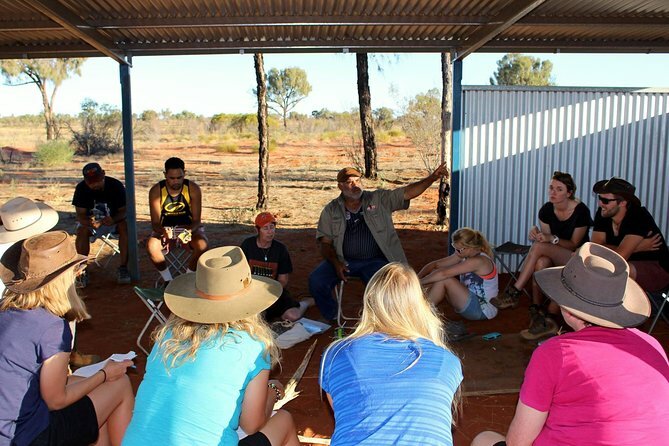 Spend time learning about the oldest living culture in the world as you travel on remote bush tracks and stop at fascinating and historically significant sites along the way. Join them for afternoon tea round the campfire and hear how they survived in this desert environment before tourism started in the region. Continue on to a private sand dune to marvel at the expanse of the desert overlooking Uluru and Kata Tjuta while enjoying light refreshments at sunset. On this small group tour, your guide will collect you from the front of your accommodation at Ayers Rock Resort in an air-conditioned modern 4WD Mercedes Benz Sprinter. Traveling through Uluru-Kata Tjuta National Park with the impressive Uluru close by, you will meet your Aboriginal host at the Cultural Centre. Join your Anangu host for afternoon tea round the campfire at a custom built shelter and learn how Paddy Uluru fought for Aboriginal land rights to where Uluru is today. Learn about the flora and fauna of the region that has been crucial to the survival of the Uluru family for thousands of years. Continue on in the late afternoon via remote bush tracks through the desert to a private Patji sand dune to appreciate the expanse of this desert region as you watch the sun set over Uluru and Kata Tjuta with drinks and light snacks. After sunset you will farewell your Aboriginal host at the Cultural Centre and your guide will return you to your hotel at Ayers Rock Resort.